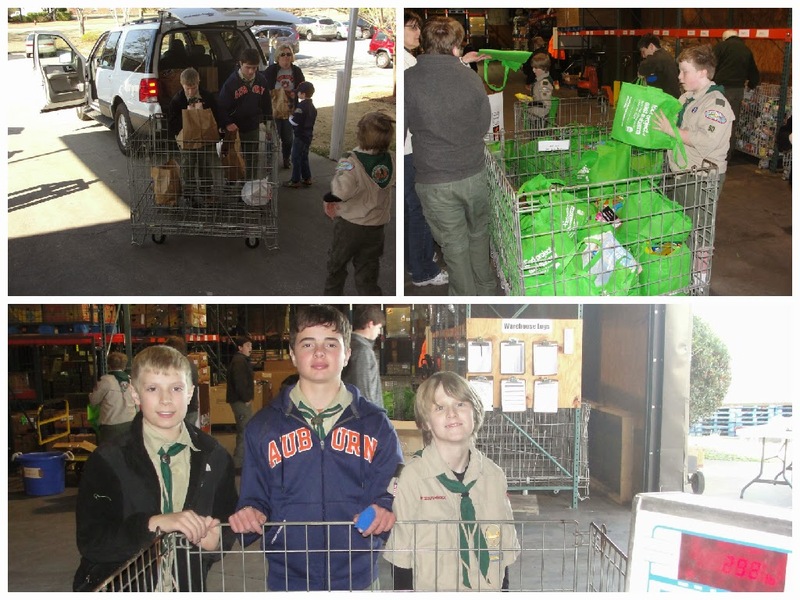 On Saturday, Feb. 14, 1,544 pounds of Troop 50 Scouts reported to the Food Bank of East Alabama to assist its staff and other volunteers with processing the nearly 10,000 pounds of donated food that moved through the warehouse in four hours — and at least one pair of hands belonging to Troop 50 Scouts, leaders and parents touched just about every pound!. As early as 9 a.m., the Food Bank's warehouse was a flurry of activity with the deliveries of donated food from Saugahatchee District's annual Scouting for Food drive, and the quarterly, neighborhood-based food-collection drives that are part of the Food Bank's "Food Project of East Alabama." Until the arrival of cars, trucks, and vans loaded with food began arriving, the troop assisted with a variety of repacking, stacking, and sorting needs the Food Bank staff had prepared for the troop. Scouts assisted with assembling boxes that would later contain the food the Food Bank provides to its member agencies such as church food pantries, shelters, and feeding programs, which in turn distribute this donated food to the needy — or food insecure — in our community. The troop also assisted with reboxing various food products, and organizing a large donation of bottled mustard items onto numerous pallets. 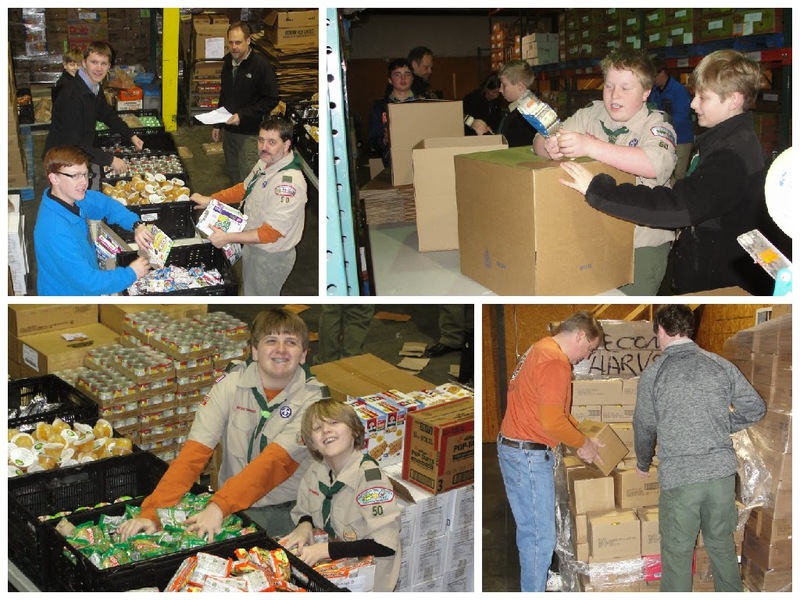 As the 6,853 pounds of Scouting for Food donations and 2,696 pounds of Food Project deliveries arrived, Scouts shifted gears by helping to sort the large volumes of food into categories that included canned items, plastic items, and items packaged in cardboard, glass and other packaging. Scouts first assisted with unloading cars, wheeling sorting bins into the Food Bank warehouse to be weighed, and then moving the bins into position to be sorted. In some cases, one bin was totally sorted before the next bin even made its way into the warehouse. Thanks to the more than 25 Scouts, leaders and parents who assisted at some point during the morning Saturday with what has become an annual troop service project. Check out the troop's online photo album for more pictures from our morning of service.